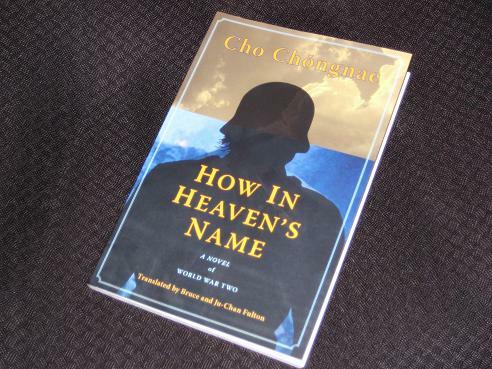 Cho Chongnae’s How in Heaven’s Name (translated by Bruce and Ju-Chan Fulton, review copy courtesy of Merwin Asia) begins in Mongolia, where the Japanese Guangdong army is in disarray, falling back in the face of an onslaught from Russian tanks. Shin Kil-man and his fellow Korean ‘volunteer’ soldiers are certain that their days are numbered, knowing that if the Russian firebombs don’t get them, their suicidal officers probably will. However, some of the stragglers manage to avoid both enemy bullets and orders to kill themselves, and for a brief time they are in the relative safety of Russian captivity. “Doesn’t it feel like we’re getting farther and farther from home?” said Kang. His voice had taken on a gloomy tinge. Fighting a losing battle in Nomonhan (a place some of you may have heard of from reading The Wind-Up Bird Chronicle) is just the first step on the journey. There’s to be long trips across the plains, the bitter cold of Russia and the warmer (but still deadly) climes of the Atlantic coast. Seoul is a very long way away. Away from the Korean issues, though, this is still a novel about the war, and as time passes, the reader knows how events are likely to pan out. One of the problems here is that the Korean soldiers don’t, and in their travels across Europe they will change sides, and uniforms, several times, without knowing which side will eventually come out on top. Once the war has come to an end, there may well be a price to pay for those who have made poor choices over the previous years, and home might be further away than ever. How in Heaven’s Name is certainly a fascinating story, and anyone with an interest in the war will enjoy reading about this little-known aspect. At just under 140 pages, it’s a surprisingly quick look at the topic, and the style is fairly straightforward, meaning most readers will knock this off in a couple of hours or so. For a writer whose fame in Korea rests primarily on gigantic, historical romans-fleuves, this book seems a little slight, but perhaps it will encourage publishers to take a look at his meatier back catalogue (although I’m not sure just how much appetite western presses have for Korean historical fiction…).